A moveable concrete barrier (MCB) is installed on Jalan Raya Pondok Labu. It is a sign of road separator. 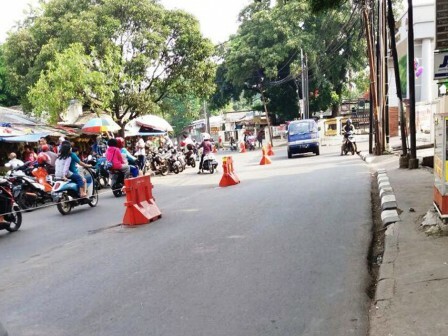 "It's done to parse traffic jam in the market area"
According to Christianto, Head of South Jakarta Transportation Sub-dept., MCB is installed from Pondok Labu Market up to Prikasih Hospital. Before being installed, the market area is always jammed. "It's done to parse traffic jam in the market area," he expressed, Monday (10/30). Pondok Labu Urban Village Head, Fauziah expressed it is very important. Considering the condition of a two-way road without a barrier, making the area prone to congestion every day. "With MCB, vehicles from the market are not free to turn in front of the market, but must turn the direction in front of Prikasih Hospital. So traffic jam starts to decrease," he stated.